Today I dumped 27 books I picked up at a Goodwill store into my 8 year old daughter's lap and she said with a genuine smile and gasp, "Oh! Thank you Mama!" I became aware of the problem when she was sick the first two days of school. I took it upon myself to give her "homework" and one of her assignments was to read a book. She was reluctant to read anything and said "I don't know how to read," more than once. It was a total shock! Her teachers never made mention of reading problems, and as a teacher myself I couldn't believe I didn't recognize the problem before. Since that day I've kicked myself for not spending more time reading with her, blaming it on the middle child syndrome, and I've been in all-out-intervention mode. I worked with my daughter at least an hour a day for three long months. There was a lot of crying, yelling, coaxing, making promises, encouraging, and sounding out word after word, before I saw any significant improvement. Here you'll find what I used to help my daughter become a better reader and what I continue to use today. One of the first things I did was sign up my daughter for an account with the Reading Kingdom online program. The program has kids read, spell, fill in the blanks, listen, and identify the correct spelling of words in 10-15 minute lessons. At the end of the program children should be at the third grade reading level. The first 30 days are free and after the trial period it costs $20 a month. Parents can cancel when the child completes the program. The program suggests completing 1-2 lessons a day, but my daughter was so far behind, and I didn't want to end up paying an arm and a leg, I had her complete double that amount. Spending about an hour a day, she was able to plow through the program in just under 4 months. After using the Reading Kingdom my daughter became a more confident speller and was able to read books at the second grade level unassisted. It was really easy to set up an account, and after I bookmarked the page on the computer my daughter was able to log in on her own. Anytime I had a question I went on Reading Kingdom's Facebook page and received a reply in less than a day. The Reading Kingdom also offers scholarships for children whose parents need financial assistance. Some children read at grade level, some below, and some above. The goal is to find the correct reading level for your child. If your child finds a book that they love, check the reading level of the book at ARBookFind.com and provide your child with books at the same grade level. The book level is labeled as BL and is followed by a number. For example, BL: 1.5, means the book is at a first grade, fifth month. BL: 7.2, means seventh grade, second month. By providing books at your child's reading level they will be more likely to understand the content and enjoy reading books. If you find your child is getting frustrated with books or gives up on a book too easily, check the reading level of the book. It's possible the book is too high for his or her ability and a book at a lower level is needed. Reading books to children is the key to nurturing great readers. Repetitive rhyming books are great for little ones. If a book becomes a favorite and is read over and over again a child will eventually be able to "read" the book on their own. When your child can read with confidence change up the routine a bit. You read the book first and they read it the second time through, or you read words on the right page, they read words on the left page. Great books for reading together at the 2nd-3rd grade reading level are the "You Read to Me, and I'll Read to You" books, there are 5 books total and there are always two fun characters in every story. 4. Keep a well stocked home library. 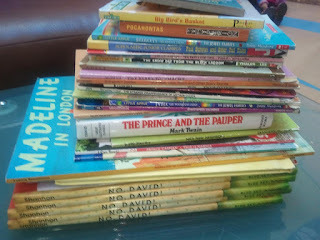 In order to keep my daughter reading I have to have a never-ending library at home. She has a shelf with books at her reading level and a "finished" basket for books she read. I rarely buy books at retail price, but whenever possible look free or deeply discounted books. Discounted Books: My goal is to pay no more than $1 for a used children's book or half price or less for a new book. Free Books: A great way to save money is to borrow books. Kids will need to be gentle with the books and return them in the same condition. To ensure returned books make it back to their original owners have a dedicated basket, bag, or area where the borrowed books are stored and only borrow from a location where you regularly visit to make returning them easier. Public libraries- The only drawback is if you are absent minded and forget to return the books. Making regular weekly or bi-weekly trips to the library & renewing books online can avoid late fees. TIP: Always check out books on your child's card; children's late fees are less expensive than adults. 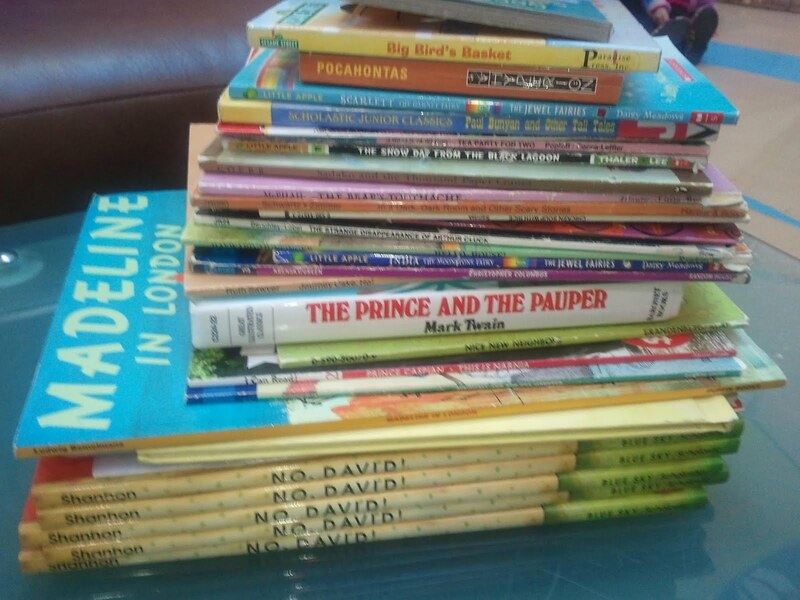 Families with children of similar ages- Some families have their own library at home and would be happy to lend books. Teacher's Lending Libraries- Most teachers have extensive libraries in their classrooms and some allow student's to take home books to read. If you have a good relationship with a teacher they may be willing to lend you a box of books over the summer or during a vacation. Doctor's Offices- I wouldn't borrow from a doctor's waiting room that treats sick children, but if your dentist, chiropractor, or optometrist has a library for children it doesn't hurt to ask. I'm a sucker for Scholastic Reading Clubs. The flyer comes home and my kids have already circled everything on their wish list. The books are usually discounted and some are available in less expensive paperback versions compared to hardcover editions in stores. I justify the purchase by knowing that for every dollar I spend the teacher earns points she can use to stock the classroom library. Orders can be taken online, but a teacher ID code is needed to place an order. Shipping is free because books are delivered to the teacher for distribution. Being able to shop online is great, but I usually end up spending more than I planned because I browse through all the catalogs and go back and forth comparing prices to amazon and seeing if the county library has the same book in stock. I once received a email with a Black Friday discount code for 20% off a total Scholastic Reading Club purchase and I jumped on the offer. I purchased a complete set of Magic Tree House books. With the discount the total came out to 55¢ per book! I get my kids hooked on books by having them read books in a series. I usually read the first book with them, or I read it myself first and have discussions about it as they read. If they love it I encourage them to read the second book in the series. After that I am set, I only have to keep the next book on the shelf ready for when the previous book is finished. All of my kid's favorite book series are listed below. Some series have as few as five books, some have over 50. All the books above can be found on Amazon or at the county libraries. If a book is not on the library shelves ask the librarian to put the book on hold for your child; you'll get an email when the book is available to pick up. It says it's open to school volunteers & home school families too. When you register simply put the name of the school your children attend and list yourself as a volunteer.